The QBE European Leadership School (ELS), based in Saint-Malo, France, is a personal development program that levers exhilarating but safe outdoor adventure to achieve remarkable results. 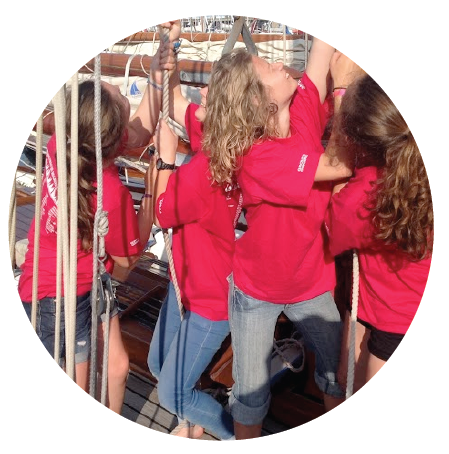 We take teens on ambitious sailing expeditions designed to help them gain new perspectives and find a new swagger. 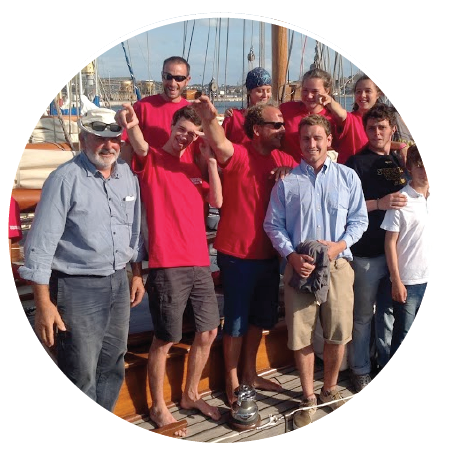 Three weeks of traditional sailing and life-skills mentoring can be transformative, especially along the culturally rich, scenic coastlines of western France, the Channel Islands, and the south of England. ELS courses provide dozens of breakthrough experiences that expand personal horizons and add impressive texture to any high-school résumé. If you’re ready for a unique maritime adventure, join us this summer for life lessons—and a whole lot of fun—on some amazing boats! The sea is an exceptional life-skills classroom. Sailing teaches you how to contend with forces you can't control and compels you to rely on crewmates for help. It requires you constantly to adapt to changing weather, winds, and tides to achieve objectives. But it's also tremendously rewarding—there's the thrill of the wind in your hair as you cut through the water and, in our case, the satisfaction of sailing into port on beautiful traditional pilot cutters. Not only are our connoisseurs' sailboats fun (and relatively easy) to sail, but they're the perfect size for teaching self mastery and life's important lessons. As an ELS crew member you learn to sail, function as an effective leader, and work collaboratively as a member of a team. The many challenges of sailing also help you develop a tenacious problem-solving mentality while individualized mentoring aims to help you organize better towards a productive, fulfilling future. In addition, you'll gain important life insights and make friends from around the world. When all the components come together, it's a powerfully transformative experience, one that will probably change your life forever. You'll be amazed how much you discover about the world and yourself. Nestled along the Brittany shoreline in western France, an area famous for its excellent sailing and abundant wildlife, the centuries-old walled city of Saint-Malo once sheltered corsairs and pirates. Today its beautiful harbor, picturesque ramparts, and vibrant cafés and shops attract visitors from around the world. Because of its excellent facilities and proximity to such destinations as Mont-Saint-Michel, the Channel Islands, and ports along the southern coast of England, it's the ideal location for a program that encompasses both yachting and cultural exploration. Operating out of the historic French port of Saint-Malo, we use beautiful hand-crafted traditional boats, constructed by old-school artisans in a heritage workshop, and fabulous adventure to help teach young men and women how to grow up. During each 20-day expedition, everyone takes turns learning and practicing the team tasks that sailing requires. We provide numerous opportunities for each student to make decisions and take responsibility for the various activities on the boats—everything from setting the itinerary to steering, choosing and trimming the sails, setting the course, navigating obstructions, giving the team orders, housekeeping, and making the meals and hot drinks. In such close quarters, participants quickly learn the importance of tolerance, trust, collaboration, and patience, not to mention the advantages of physical and mental fitness. Remember, too, that there are boats and then there are boats. Traditionally rigged yachts have over a mile of rope that can be manipulated to achieve greater speed, unlike most modern sailboats. That means everybody has to pitch in to keep up with the "rival" boat. In fact, it's hard to think of a better way to teach teamwork than working together on a classic yacht. On land, the group visits historic sites, attractions, and museums. Ports along the English Channel are rich in history and culture. And when weather allows, we take walking tours of islands and towns. Most mornings, there's an hour or two set aside to discuss some of the classic texts on effective life management and leadership. There's also time for reflecting on how to apply acquired insights. Of course, at the end of the day, leadership is ultimately about "becoming"—becoming self-confident enough to make calculated decisions and persuade others to follow. Developing a resourcefulness forged by challenges. And overcoming the paralysis caused by a fear of failure or lack of motivation. That's why we do what we do the way we do it—the way we've done it for years. And why it's not uncommon for students, standing at the bow of a pilot cutter under full sail, to be struck by a rush of exhilaration and a sudden unexpected awareness of their amazing potential. QBE (Qualified by Experience), the ELS's parent company, was established in 1992 by Will Sutherland, the longtime expeditions leader at Aiglon College in Chesières-Villars, Switzerland. Will was a protégé of the school’s founder, John Corlette, who spent several years working with celebrated educator and outdoorsman Kurt Hahn. Hahn, best known for promoting outdoor life-skills training through his Outward Bound® program, also founded two leading European schools, the Schule Schloss Salem in Germany and Gordonstoun in Scotland. Both headmasters were convinced that students should be challenged not only academically but physically and emotionally through demanding life-shaping experiences. Will learned to sail at the age of six and annually competed with his father in the Enterprise UK National Championships. He went on to study at St. Luke's College, Exeter, majoring in physical education, mathematics, and education. A keen sportsman, he spent his last year at college white-water canoeing, canoe surfing, climbing, diving, and sailing ever-larger boats. While at Aiglon, Will kept a 36-foot sailing sloop at Antibes in the Mediterranean. During school breaks, he taught groups of students to sail and took them on yachting expeditions designed to build their skills and self-esteem. He also coached the J24 racing team that competed at Cowes Week for seven years. Aiglon teams won the class five times and came in second on the other two occasions. Will, who once also worked as an instructor at the Royal Yachting Association Sea Schools in the UK, holds RYA Yachtmaster Ocean certificates with a commercial ticket. * QBE is not affiliated in any way with Outward Bound®. Our two pilot cutters are faithful reproductions of an original 1891 cutter designed by St.-Malo boatwright François Lemarchand. Originally designed and built to guide larger ships into harbor, our yachts recently have been refurbished to become unique classrooms at sea. Cutters are large enough to be eminently seaworthy (46 feet), but small enough so that novice sailors can quickly learn to trim the sails, take a turn at the helm, and make navigation decisions. Each boat has been meticulously maintained, and they are inspected annually to ensure safety. There's also safety in numbers. That's why we always travel in a small flotilla. Because the boats are in the same class, there's no opportunity for one boat to race ahead of the other. Participants get the chance to sail each boat, learn their individual personalities, and get to know each member participating in the course. And be advised: Every time you sail into a port, people will be taking your picture (and posting to Instagram). The boats always attract a lot of attention. It's not uncommon for several dozen people to crowd around the yachts to try to get a good look. The ELS is an exhilarating, breakthrough experience that affords young men and women a unique opportunity to expand their horizons and discover in nature, in other cultures, and within themselves a “generous splendor” that will serve them throughout their lives. Welcome aboard! QBE's European Leadership School is a premium outdoor adventure. We recruit impressive young adults for an authentic sailing experience, on extraordinary boats, in a beautiful and culturally rich corner of Europe. Each course is supervised by a director with extensive experience and an exceptional mentoring pedigree. There are only 12 places available in each session. The fee for each 20-day expedition is £3,900 (about 4,600€ or US$5,200), not including transportation/airfare. Participants arriving by plane will be collected and dropped off at Paris airports. Crew members arriving from the UK may want to take the Portsmouth–St.-Malo ferry. To apply, simply fill out our online application form and click "submit." Once your application is accepted, you will be sent additional information, including fee schedules and instructions, health forms, and a contract. A £400 deposit (approximately 500€/US$550) holds your place until the fees are due. We look forward to welcoming you aboard. If you wish to apply, or if you have any questions or comments, please feel free to call us, send us an email, or—the easiest option of all—use the message box provided below.